Review: August Greene, 'August Greene' August Greene, the supergroup featuring Common, Karriem Riggins and Robert Glasper, peers at the state of the black union through a jazzy, hip-hop lens. 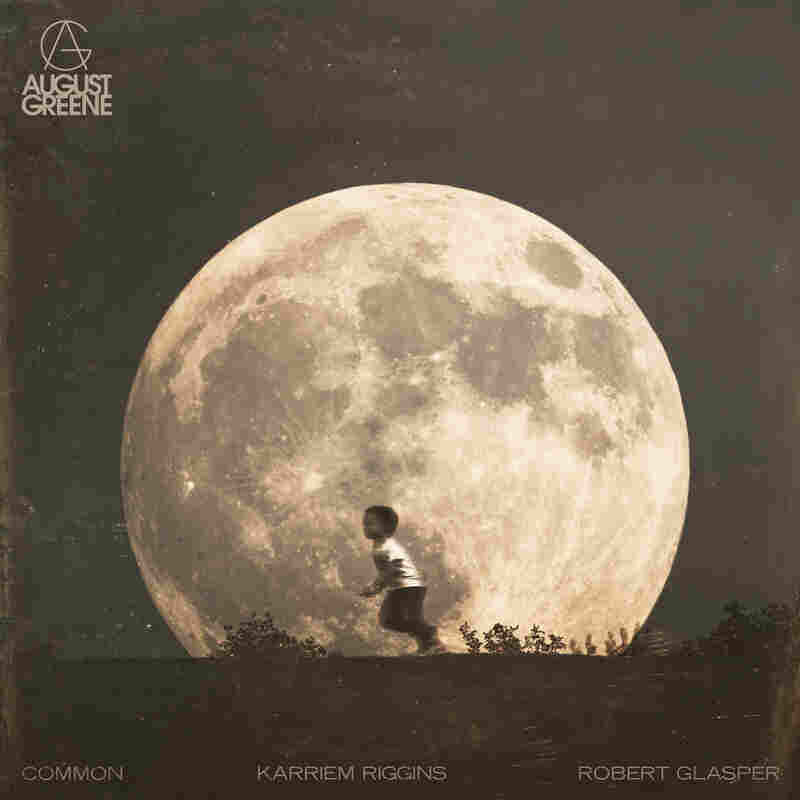 August Greene is out now via Amazon Music. "As we go into the well of the black pool of genius," Common intones during the opening bars of August Greene. It's a fitting incantation for a time in which black culture increasingly defines America's pop consciousness, even as black people are defiled by the sociopolitical will of a restless nation. This is where August Greene comes in. The supergroup and its self-titled album are both spawned from an award-winning collaboration between long-time friends — prolific spitter Common, genre-bending composer, producer and jazz pianist Robert Glasper and drummer/producer Karriem Riggins. Together, they scored an Emmy with their theme song, "Letter To The Free," for Ava DuVernay's piercing look at race, injustice and mass incarceration in the Netflix documentary 13th. The resulting award made the Chi's native son, Common, the only rapper one Antoinette Perry Award shy of attaining an EGOT (Emmy, Grammy, Oscar, Tony). That aspirational trajectory courses through a debut album that finds all three players melding a cohesive identity around the intersection of black music's evolution through jazz, R&B and hip-hop, while collectively reflecting on the disparate state of the black union. Every phase of Common's career has been outlined by a succession of sonic architects who shaped his sound. It started with the No I.D. years, followed by the Questlove-J Dilla-Soulquarian era and, more recently, his Kanye West-G.O.O.D Music affiliation. Interestingly, Riggins has been a constant collaborator and contributing producer throughout them all. Common's connection to Glasper also stretches back to the '90s. So, in a sense, his latest phase — call it the August Greene years — finds Common coming full circle. Few rappers can lay claim to his uncommon career longevity. In the quarter century since his 1992 debut (Can I Borrow A Dollar? ), he's gone from Chi-town's native son to Hollywood hearththrob. But his penchant for thoughtful introspection remains consistent, and it's the guiding force in a timely collection that finds him wearing the hat of a hip-hop statesman. August Greene's debut single, "Optimistic," features the voice of R&B chanteuse Brandy in an inspirational remake of Sounds of Blackness' 1991 hit single. "Black Kennedy" finds Common celebrating like a royal heir in the aftermath of the nation's first black presidential family. This is an MC, after all, who can now count performing at the White House on multiple occasions — including one Tiny Desk — among his accomplishments. But August Greene ain't all blind faith and empty promises. If Obama's legacy has taught anything, it's that hope has an opposing darkness that must be confronted. And no one does introspection better than Common, who flows poetic on "Practice." "Let Go (Nirvana)" finds him soul searching over faint Glasper chords and Riggins' percussive loop, while contributing vocalist and film score composer Samora Pinderhughes adds a soft lilt to the chorus. Far from the typical soul belter, Pinderhughes' tone evokes a meditative state aligned with the now. On "Fly Away," Common gets reflective while considering his own relationship issues as he parses out a past with equally public figures such as Taraji P. Henson, Erykah Badu and Serena Williams. "I was in love with an actress, a singer and a tennis player / Star Wars of love, every princess had a layer," he rhymes, adding a clever wink to "Bag Lady" Badu herself. "Checking in and out of Heartbreak Hotel, man / Bag lady I'm the bellman." This is grown-folk rap, to be sure, but August Greene is future-minded. The concern for the next generation is most pronounced on "Piano Interlude," a short spoken-word intermission. "I met a little boy / He asked where are we now? / I met a little girl / She asked me if I was proud? / Of what I've become / And what the world will allow," Common says, before adding, "I might put up a fight / but yet and still I'm losing ground." When he follows up that thread with the age-old inquiry — "If a tree falls in a forest and no one hears the sound, did it really ever happen at all?" — the track ends without an answer. Instead, it hangs in the air like a point of provocation, forcing us to reckon with the whirlwind of America's past decade.